In today’s world of digital abundance your business website needs to work extra hard to gain the confidence of those who visit it. Unfortunately we live in a world where we judge by appearances, making split second decisions for better or for worse. That’s why, figuratively speaking, your website needs to dress smartly and make eye contact if it is to stand a chance of standing a chance. Indicators of “trust” are little details that make the big difference to how your brand is perceived through pixels. Trust signals include anything from graphic design and copywriting to social media and engagement. Trust has become an economy all of its own. A firm virtual handshake is the precursor to any transactions. Disclosing details openly and transparently while providing value is more likely to produce the ideal returns such as backlinks, reputation and of course, customers. The burden of proof weighs heavy on the unknown brand so it’s vital to offer reasons to have site visitors stick around. A picture of a face – your face – is a shortcut to establishing the human element. Your photo invites the potential new client see with whom they will be investing their cash should they decide to have dealings with you. The social web demands a real photo of a real person. Why hide yourself? No point trying to be The Wizard of Oz, is there? Typically, the area of a website most people choose to display a photo is on the sidebar. WordPress sidebars appear on every page of the site by default but you could always place your image on the “About Us” section as well. If you’re interested to learn more about conveying the right image see what makes a face trustworthy? The website About page is a tremendous opportunity to cement a relationship between provider and customer. When a customer views this page they’re expressing interest in the people/person behind the brand, so let them to discover your origins, story, mission, personality. Using videos, podcasts and blogs on the About page are chances to tell the audience about the why and the who surrounding your business. In the topsy-turvy information age of free-flowing consumer sentiment, businesses must mitigate any ideas that they might be uncaring. As small businesses, let’s consider what we can learn from the trust building campaigns of industry titans. Did you see the McDonalds video disclosure on how McChicken Nuggets are made? I rarely eat McDonalds, but admittedly, I feel a bit better about what I’ve always regarded as a plastic corporation after witnessing what goes on in one of the factories. Chipotle scored a viral hit with an aspirational video communicating their position on welfare issues affecting the fast food industry. Who are the people behind the business? What kind of people will customers be working with or buying from? When it comes to demonstrating your business is not a fake fly-by-night operation, establishing where your business is located is the low hanging fruit of trust building. If you haven’t included an address on your website, don’t be surprised if people hesitate to contact you. How do you think it looks when a business fails to list an address? What is there to hide? The exception is that some businesses are operating from their kitchen table or spare room at home, and the thought of placing your residential location “out there” for the world to see is nerve-wracking. If you ARE a homeworker, use a virtual office address with a mail forwarding system. This keeps your home life private while establishing a physical location for the business. You want website visitors to stick around, right? You want readers to devour your stuff, keep coming back, link to you, feel convinced and be converted into a happy customer? This is why it’s important to aim to publish excellent quality human sounding blog content rather than quantities of generic encyclopedia fluff. 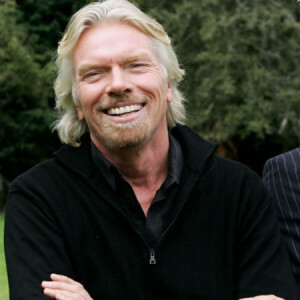 Richard Branson is an expert in communicating his values through blogs. By sharing his beliefs about family, honesty and the betterment of mankind, he has won legions of admirers worldwide. He is no longer a small business – he’s a tycoon – but once again, just like with Chipotle, he has thought through his own principles and worked towards stating his position. What I’d really like to draw attention to is Richard’s blog articles and the use of the personal pronoun “I”. The casual first person narrative is very effective for someone like Branson, known more for woolly jumpers than stifling suits. Think about your own audience and how they want to be spoken to. Without question your content should be human. By that I mean you should drop any pretensension. Adopt shorter words. Avoid sounding like an academic essay. My old graphic design student essays from 2004 are filled with fancy pants terminology because I was trying to sound authoritative in making arguments. This is what we were taught to do in academic writing. In 2016 on a small business website, readers tend to think you’re affecting airs and graces if you utilise use an academic style. Quick lesson: the word “use” is of Anglo Saxon origin, while “utilise” is of Latin origin. You don’t need to discard chunks of hard-earned vocab, but you should err towards the Anglo Saxon words because they form the common tongue. When a reader feels undecided about a website they’re looking at, a basic serving of meat and potatoes prose is ten times better than a complicated word salad. Instead of writing for their website, some businesses have had success producing audio podcasts. An actual spoken human voice is as human-sounding as you can get! Attention spans are in decline. Consequently, a website has mere seconds to make an impact. If you foolishly exhibit a kack-handed grasp of written language, don’t expect the casual visitor peering into your virtual shop window to bother walking through the door. No one is perfect and we all make mistakes. But if you’re not even trying to maintain decent written editorial standards you’re doing a huge disservice to your image. Case in point: know the difference between “effect” and “affect”. Correctly use “your” and “you’re”. To avoid glaring literacy blunders it’s highly recommended to read real books with higher editorial standards – fiction as well as non-fiction – as an antidote to some of the crap online. 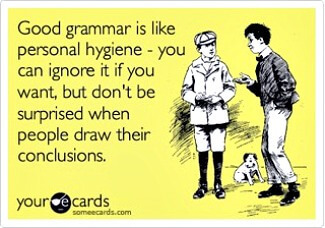 If you want to brush up on literacy take a look at The Compact Guide to Grammar for Busy People. Avoid long, difficult to pronounce website addresses. If you’re stuffing keywords like it’s 2010 you’re risking the would-be visitor dying of old age before they finish entering the URL in their browser. You’ve seen businesses using very long subdomains, usually a free URL they got from a platform like Blogger or Wix. Immediately, this ugly URL destroys any notion that this is a legit accounting service because it looks cheap, tacky, dodgy. Though doubtful, it might be an amazing website packed with stellar content, yet it falls down at the first hurdle because potential visitors cannot get past the prejudice they feel towards the URL. Instead, stick to something short and sweet and easy to pronounce using a paid for top level domain (TLD). Domains can be had from DreamHost or GoDaddy at a reasonable annual cost. We’ll all feel better about your website if you spend some time and money on it. This is the practice of demonstrating social interaction around your brand to bring a sense of community to your website. Follower numbers are often regarded – perhaps rightly so – as a vanity metric, yet a high social follower count plays into our hard-wired biological predisposition to think in terms of safety in numbers. There’s the reassurance of treading an already beaten path – a sort of “bandwagon effect.” Afterall, when a customer is faced with the agony of choice, the social effect of your site could be what swings the vote in your favour. If you’re looking to flaunt social follower numbers, consider placing the social widgets high up on the website, in the header. Are the numbers are very low? As in less than 10 followers? It might be better to wait until you have a few hundred or few thousand before advertising those follower counts. To get the numbers moving upward you can do the “Like for a Like” or “Follow for a Follow”, at least initially. The other thing you can do is embed social media timelines somewhere on your site to show recent updates and demonstrate replies/engagement with peers, associates and customers. Below is the Small Biz Hour Twitter timeline. Don’t forget blog comments either. Encourage readers to leave comments at the end of blogs/pages so you can reply to them. Other website visitors will witness these interactions and are more likely to form a higher opinion of your brand. 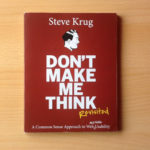 I’ve linked to a good article here about getting more blog comments. Attracting comments is easier said than done and it’s an area I’m working on myself. We take advice, news, products and services more seriously from one source over another because of a conscious or unconscious bias. This is where graphic design and web design play their roles. Design is visual communication – images that speak – and can say lots within milliseconds. For example, did you know the human mind processes imagery approximately 60,000 times faster than written words? Now, if your graphics are stretched, pixelated, or of a low standard, you’re causing site visitors to negatively judge your brand ….60,000 times faster. Good visuals help make your point and prop up written copy. It is like adding content to content. Make sure any graphic design logos you commission is produced as vector paths using something like Adobe Illustrator. The quality is higher and the designs can be repurposed for other projects. Because the web is becoming increasingly visual, the importance of quality graphics cannot be emphasised enough so use the opportunity to show care and attention. When I see poorly produced graphics on websites it immediately makes me wonder if they can afford to hire someone and therefore what type of operation they’ve got going on. When it comes to fast-tracking the overall appeal of your website, design is the big one. For example, if you have an email contact form, or a survey asking for their details, how are you handling that data? Revealing what goes on behind the scenes is not only a massive affirmation of credibility, it’s common procedure and in most cases a legal requirement. Oddly, it’s a subject some of my website design/development clients don’t expect me to bring up when discussing strategy. I guess it doesn’t seem like a priority but the devil is in the detail and it should really go without saying. If you struggle with this, lots of free templates for website disclosure pages can be downloaded online and modified as appropriate. This “legal boilerplate” is not just for the benefit of other humans reading your site, by the way. It’s as much about pages containing these passages of text for your website SEO. Search engines can detect whether or not you have included adequate data disclosure, information on cookies or website terms and conditions, and it is on this basis that your site is being silently assessed for how genuine it seems to be. Use your website to link to or display positive reviews and or/testimonials by delighted clients. Set up a page for your reviews/testimonials on your website and funnel undecided/new customers to this part of your site. It proves you are who you say you are and that you do what you say you do. It’s possible you’ve already great reviews on Google Plus, Yelp, Facebook, Trip Advisor, LinkedIn or whatever it happens to be. My advice is to copy those reviews to your website either by pasting the plain text or by taking screenshots. The reason I advise taking the screenshots is because Google reviews have a nasty habit of disappearing due either to bugs in their system or an overly aggressive spam filter. Get listed on Google Maps and start collecting those votes. I also made a YouTube video showing my web design clients how to leave reviews. Whether you’re a consultant, tiny team, or agency, those involved in the business operations can help make the brand warm and fuzzy and attractive. The transactional business relationship occurs once a website visitor is satisfied by the expectations set. Remember, people do business with people, so when in doubt, be human. Avoid the tendency some businesses have to try coming off as aloof, a big shot or a tough guy. Everyone is scrambling to build a marketing mouse trap but many forget about creating a website that wears integrity on its sleeve.